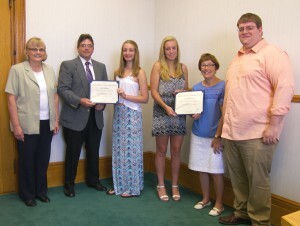 OSWEGO – The Professional Journalists and Communicators of Oswego County announced the recipients of the organization’s Muriel Allerton Scholarship Award. The PJC announce the recipients of the club’s Muriel Allerton Scholarship award. From left are: PJC Treasurer, Mary Ellen Barbeau of the Oswego County Dept. of Tourism; PJC Vice President, John DeRousie of Custom Marketing Solutions; award recipients Alexia Abelgore of G. Ray Bodley High School in Fulton and Rachael Purtell of Oswego High School; PJC President Marion Ciciarelli of Oswego Health and PJC Scholarship Award Committee Chairperson Ken Sturz of the Post Standard. Awarded annually to a graduating high school senior from the county who is planning to continue their education in a communications-related field. The recipient is selected on their level of interest demonstrated in their chosen field of study and the aptitude and proficiency displayed during his or her high school career. Past award recipients have included students who chose careers in print or broadcast journalism, public relations, advertising or graphic design. Due to the number of worthy candidates for this year’s scholarship, the selection committee for the PJC Muriel Allerton Scholarship Award chose two deserving students. Alexia Abelgore of G. Ray Bodley High School in Fulton and Rachael Purtell of Oswego High School. Abelgore, who also received G. Ray Bodley Academic Award for Journalism, was a staff member of her school’s newspaper, The Raider, as well as its online daily version, The Raider Net (which appears on-line in Oswego County Today.com). A flautist with the school’s Wind Ensemble and Symphonic Band Abelgore also participated in Oswego All-County Chorus and as a soloist in the annual NYSSMA Solo Festival. She was also a member of the 2014 Area All-State Choir. In addition to her journalism work Abelgore was a member of the Drama Club, performing in the lead role in the club’s production of Thoroughly Modern Millie. She will be attending SUNY Oswego in the fall to study Broadcasting and Journalism. Purtell ranked third in her class at Oswego High School and is a member of the National Honor Society. For the past three years she served as a member of the Buccaneer Bulletin staff and the OHS Paradox yearbook staff. Purtell has received awards from the Empire State Scholastic Press Association and NY Press Association, including Journalist of the Year in 2014 and a merit award for her work with this year’s Paradox yearbook staff. She also participated in several varsity sports and was a member of Member of Students Against Destructive Decision. She will be attending SUNY New Paltz in the fall to pursue a dual major in Communications and Computer Science.